I figure I should try to share this maternity session before I finish their newborn session haha. Their little man decided he’d arrive a few weeks early – surprise, surprise. He was a joy to snuggle with and I cannot wait to share his session too but back to this one. 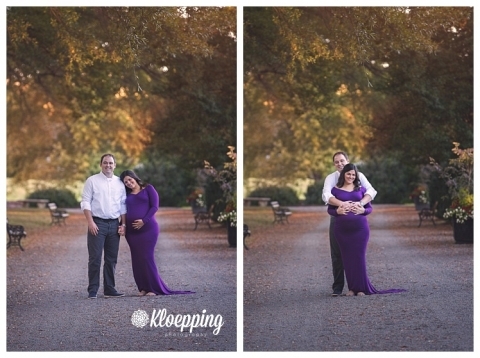 His momma is modeling another of my gowns and I love love love this purple on her! We were over at Morven Park again which is currently my favorite location to conduct sessions at. There are soooo many options to choose from that I could possibly not use the same spot twice (although I do since there are a few that are just incredible). As a photographer in Loudoun county there are many many options for locations. It all depends on the vibe/feel you’re hoping for in your photos. During our pre-session consult we’ll talk about that. Many want a natural or rustic but I’ve had a few lately that wanted more structural and contemporary (for which we used the fly overs at the reston metro station!) I promise we’ll find the perfect location no matter where or what you’re looking for! Back to Coral and Andrew – I actually first met them a few years ago when I was running a half marathon in Loudoun wine country! We share a mutual friend and we were all running so we decided to meet up at whomever’s home was closest and head over to the starting line together. Her husband joined her at the crack of dawn and showed up on the course to cheer everyone on. We all met up after and shared a bottle of wine in celebration of surviving. When I mentioned I was looking for a model for these dresses our mutual friend volunteered here. I’m sooo happy she did. We ended up with quite possibly the most perfect weather – not too hot, not too cold and the gnats were at a minimum (an unfortunate side effect of all the awesome greenery). No matter – they rocked the session and were so much fun to hang with!! She was a goddess who rocked her 36 week bump! !